10.11.11 Joshua Quint won the Eastern Maine Open played on October 1st, 2011 at the University of Maine in Orono with a score of 3.5 points in four rounds. 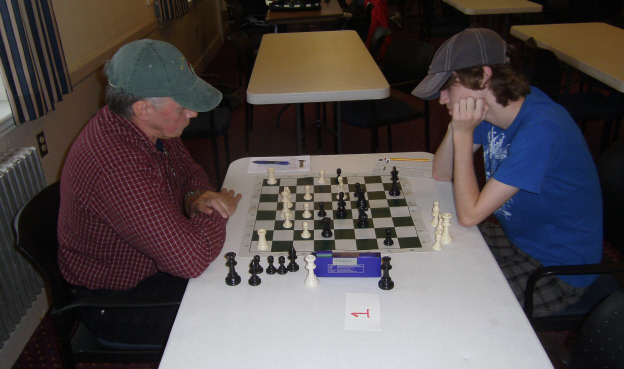 At the same event Roger Morin, who put up 2.5, chinched the Maine Chess Association's Chess Player of the Year title. J. Paul Ciarrocchi won the U1400 section of the event with a perfect 4.0 points in four rounds. Here's an illustrated tournament report with USCF crosstable. 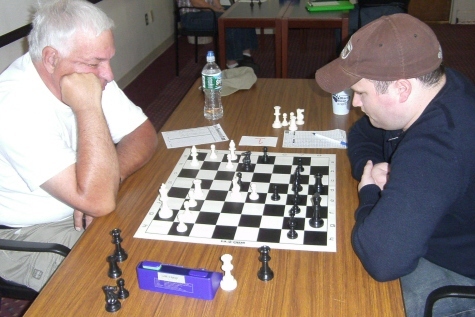 Tournament winner Joshua Quint (right) plays Roger Hardison in round two of the 2011 Eastern Maine Open played at the University of Maine in Orono. Thanks to Tom Sandford and Roger Morin for contributing to this report. Joshua Quint (3.5/4), a former UMaine undergraduate player, was the winner of the Open section of the Eastern Maine Open, the final event for the 2011 Chess Player of the Year competition, held at the University of Maine campus on Saturday, October 1, 2011. Wesley Parker from Cape Elizabeth and Roger Hardison from Presque Isle tied for second with a score of 3.0/4.0. 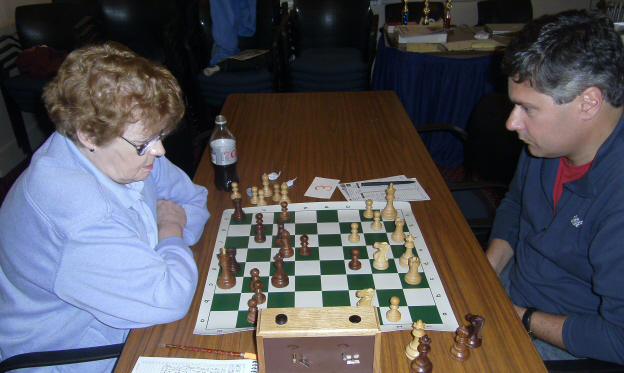 In the Open section, the competition was strong with the average rating of USCF 1696. The winner of the Under 1400 section was Paul Ciarrocchi (4.0/4.0) of Holden, and the winner of the Under 1000 section was Colin Smith (2.5/4.0) of Cape Elizabeth. Nicholas Kawamura of Veazie was the winner of the Under 600. This was the third consecutive year in which a participant's USCF home state was outside of Maine. This year Mike Dudley traveled to the tournament from Greenville, New Hampshire. When Mike was president of the George Cunningham Chess Club at UMaine in 2004, he was responsible for reactivating the Eastern Maine Open. Before reactivation, the Eastern Maine Open had not taken place since George Cunningham's death in 1994. The tournament was directed by Tom Sandford. 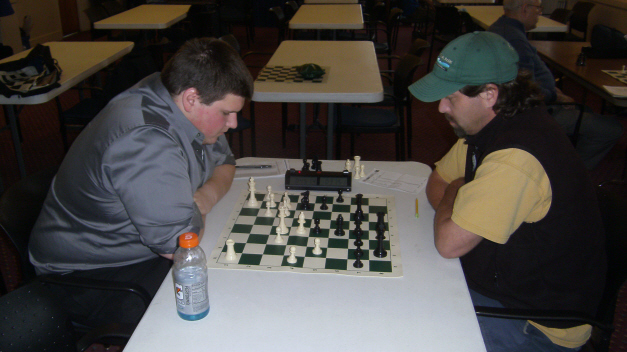 2011 Maine Chess Player of the Year Roger Morin (right) plays Collin Calhoun. 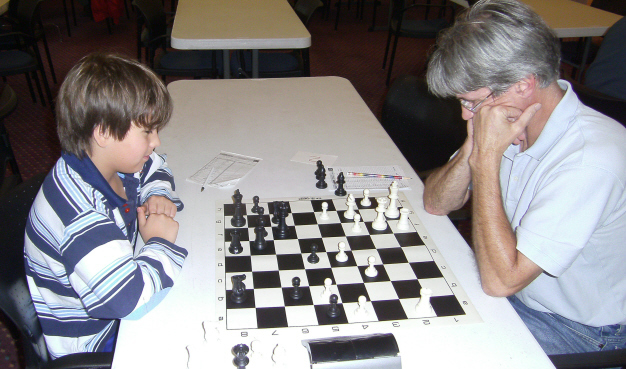 U1400 section winner J. Paul Ciarrocchi (left) during his second round game with U1000 section winner Colin Smith. 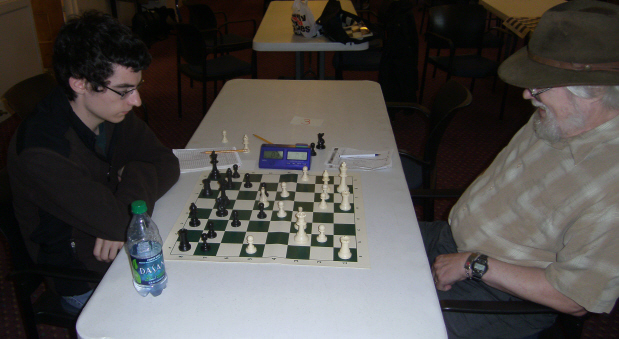 U600 section winner Nicolas Kawamura (left) plays Ted Smith. 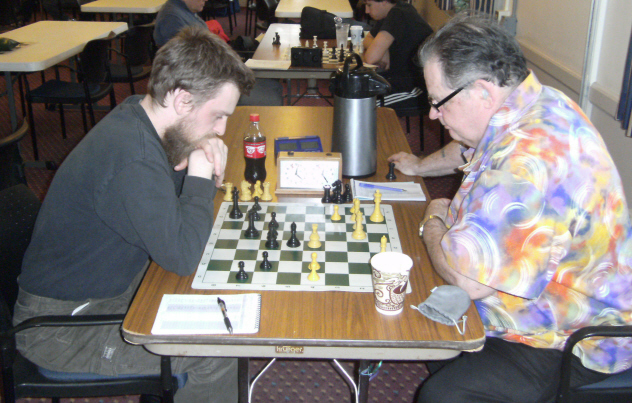 Aaron Spencer (left) plays (and betters) his former chess coach Yuri Riabkov. Lois Morin (left) plays Mark Parker. Steve Abrahams Mark Woida ended 1-0 for Abrahams. Max Berube (left) tangos with Lance Beloungie.